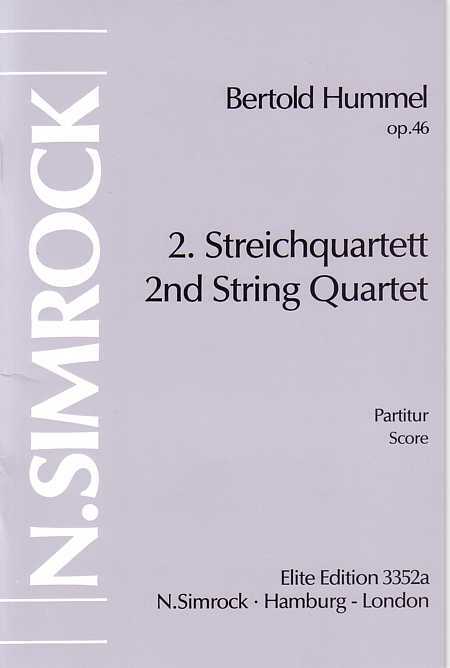 The two movements of the Second String Quartet have the titles "Mosaici" and "Lamentationes". In the first case, the title gives some general help in picturing the formal structure. This is put together as a network on different levels, connected by two particular four-note motifs. The multifaceted "mosaic"-like constellations and transformations of these elementary building bricks result in a constantly changing, colourfully gleaming sound-picture. In the reworking of the four-note components, the note constellation B-A-C-H (German notes b-flat, a, c, b) plays a central role. Because of the constant presence of three times four notes, concentrations in twelve-tone manner would seem an obvious internal construction principle for the movement. The composer does not submit however to the strict consequences of dodecaphonic rules (as also for example Anton Webern), but makes "free" decisions on the forming of twelve-tone constellations in both consecutive and simultaneous patterns. A solo for violoncello marks the middle of the first movement. Around this, there is a concentric arrangement of development sections corresponding to each other. Thus something of the beginning of the movement is heard again at the end. In the "Lamentationes", the title refers to the recitation formula to which the "lamentations" of the prophet Jeremiah are sung. The liturgical material is involved in the course of the three sections of the movement in linear interweavings and undergoes multifarious transformations. For the realisation of the form structures in sound, the composer requires from the players all means available on stringed instruments, usual as well as unusual. The 2nd String Quartet, op. 46 was written as a commission for the Bayerischer Rundfunk (Bavarian Radio) and was premièred at the opening of the concert series "Olympischer Sommer" 1972 in Munich. An example of responsible treatment of a traditional genre without giving up one's own musical language and creative will is to be found in the 2nd String Quartet (1972) by Bertold Hummel. In the 1st movement ("Mosaici"), elements of sonata form are continually to be seen and receive, through the use of the most various string techniques, new life in the sense of individual expression. In this, the predominant feature of the material is the intervallic structure of small motif cells. Glissandi, already appearing in parallel in this movement, gain in constructional significance in the second ("Lamentationes"). Besides this, horizontal mirroring and a kind of mixture process based on a whole-tone scale have important functions in the formation of this once again motif-based movement. In the compositional fusion of string technique and motif-based processes, this work deserves particular recognition.